$1.29 Pricing Infects iTunes. Others To Follow. GUEST POST BY IAN ROGERS: On a recent road trip, Topspin's Ian Rogers came across two distinctly different artists who are finding success by combining a lot of hands-on grassroots marketing with a dash new technologies. I met a band called Halestorm through the magix of the Interwebz. They were in LA making their record with Howard Benson when they saw word of one of the Topspin meetups on Twitter. They came out, introduced themselves, and we talked the future of music a bit. Turns out they’re on Atlantic and touring with Shinedown. Luck would have it they were playing Boston the same weekend I was there for the conference and visiting my eldest daughter Zoe (who’s in college at MIT). After securing some heavy duty earplugs for my two year-old we rolled out to the new House of Blues across the street from Fenway to check out the show. Lzzy starts solo with a guitar around her neck and a mic, just singing acapella. Long notes, killer voice. She has people cheering for her before the rest of the band even walks out on stage. Before her voice gets hidden behind the rock, she lets ‘em know she can sing and you can see people are impressed straight away. The rest of the band appears and they tear through a few songs. It’s straight-ahead rock, on the heavy side but ready for pop radio. Everyone in the band is high-energy and engaging, even Lzzy’s brother Arejay on drums is standing up for parts of the songs and just generally being a showman. Mid-way through the set Lzzy announces they have a new record coming out in a few weeks but you can buy a pre-release of it now for $5 at the merch stand. There’s a drum solo-y part that doesn’t go on long and ends with the entire band at the front of the stage playing drums and the crowd cheering as they go crazy with it. 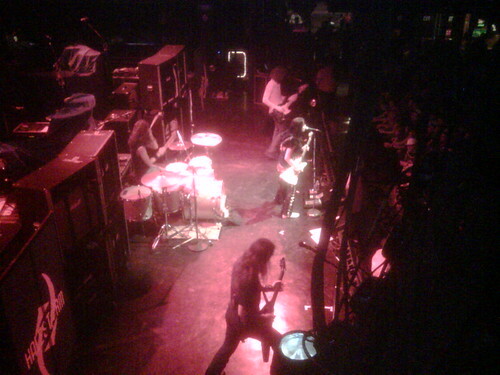 During the last song Lzzy reminds them that they have their own merch stand upstairs and CDs for only $5. She also says the whole band is going to be up there after their set and that she wants to meet everyone. I head over to the merch stand after the show and watch their tour manager relieve the woman who runs the merch table so she can disappear into the crowd below with a box of CDs with “Halestorm CDs $5” written on it. The merch stand is mobbed. It’s surrounded by people and they are selling merch literally as fast as their tour manager can manage. The band appears (after breaking down their own stage setup) and meets and talks to as many people as possible, while helping to sell their merch. Free stickers list their MySpace page, etc. Very very well done. I’m not worried about these guys at all. Even if the record doesn’t work at radio (it may) they’re going to do just fine building their audience one show at a time. The next day I heard from another artist who found me on the Internet after one of my public speaking to blog post translations: D.A. from the Harvard-educated and on Pharrell’s label Chester French. 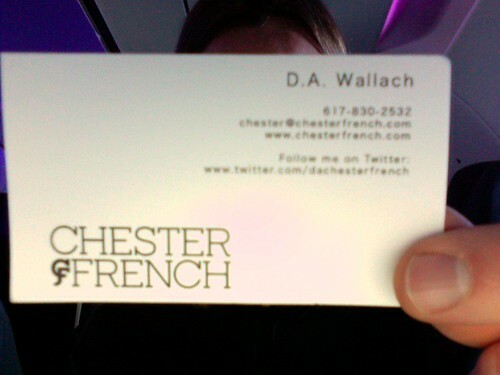 Chester French has an opening slot on the Lady Ga Ga tour and it turns out D.A. was not only in the same town as us for a Monday night show his tour bus was parked at the same hotel we were staying at. D.A. is one savvy guy, far from your average bear, and runs his own Salesforce.com setup to manage his band relationships with everyone from press to fans. He hands out cards every night with his URL, TellMe number, Twitter URL, and an email address that automatically adds people to his Salesforce setup. DA Selling CDs outside of a show from Chester French on Vimeo. Not only that, but he hustles on the street selling CDs after every show. People who saw them play, people who didn’t, passerbys, anyone who will give him $5 in exchange for a CD. So yes, I encourage you to support these artists: follow Halestorm or D.A. on Twitter, pre-order Halestorm or Chester French’s upcoming releases. But also, watch and learn. These artists aren’t waiting for someone at the label to make them a priority (though I think both are priorities for their respective labels). They’re using the tools, doing the work, connecting directly and building real relationships with fans. That’s as close to a silver bullet as you’re going to get. This post was excerpted with permission from the Topspin Media bog.